I must allow for an element of chance however good fortune should follow. The Eight of Hearts means good things can be expected. My friends will put forth a great deal of effort to win through to my goals however energetic and persistent I will be I can only hope for partial fulfilment of my hearts desires. The Nine of Diamonds indicates my heart’s desire will be fulfilled. I can expect injustice I have suffered to get worse. The Ace of Spades indicates misfortune however it can also carry a good omen in that arduous efforts and steady application will result in success. I can count on steady improvement in my circumstances. The Ace of Hearts is my home. My home is surrounded in rivalry and jealousy, one heart good luck, happiness and love and one Spade, bad luck and disaster. I can be certain that jealousy on my part or that of mate will blemish marital happiness. The Ten of Diamonds is considered to be an omen of travel. I will find that jealousy will bring trouble and sorrow. The Seven of Diamonds is considered to be the coming of harsh criticism. It also means a young foreign girl. I will not derive much joy from a relationship because it will tend to be artificial and transient. I might as well forget it and turn my thoughts elsewhere. The Ten of Spades is considered to be one of evil in my enjoyment. It indicates that I have suffered some grief in the past. I will suffer dire consequences as the result of misrepresentations calculated to damage my reputation. Others will lose many friends through the ill will of my enemies. The Queen of Spades indicates a woman that is unsociable and jealous. I can expect my rivals to be victorious over me. They will do everything possible to dishonour me with the people in my intimate circle. 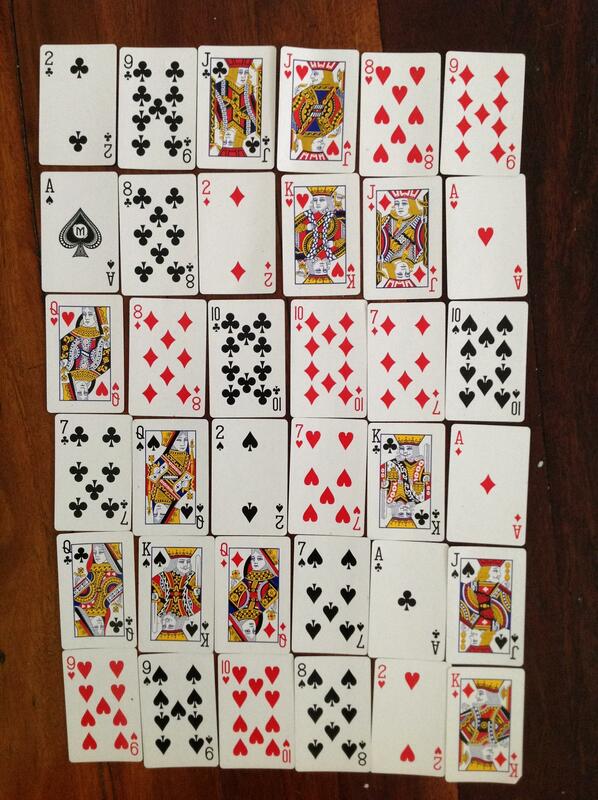 The Two of Spades denotes a change in the base of operation or location of the home. I will receive a beautiful and unexpected present. The Seven of Hearts mean that I will be married within a short time. I can expect my loved one or friend to be loyal but he or she will be lacking in other respects. The King of Clubs means that I will meet a fair minded rival. I must be prepared to overcome problems, malice and envious rivals. Once this is done I will obtain advancement. The Ace of Diamonds signifies that I will receive a letter that will be of a business nature or be accompanied by money. I cannot look for success in my endeavours because my competitors will be vicious and spiteful. The King of Spades has no special significance. I will work diligently to effect a change but my efforts will be wasted. The Queen of Diamonds is a woman who likes to have a good time. The connotation is adverse. I will be faced with the untimely death of one of my foes. The Seven of Spades is the coming of heartbreak. I will receive a suitable reward but I must earn it through industriousness and perseverance. The Ace of Clubs indicates that my life and affairs are well organised. My hopes and wishes are realistic. Through energy and perseverance I will be able to see them come true. It is an omen of success in my career. No matter what my career is this card assures me of loyal and helpful friends throughout my lifetime. Many benefits are bound to come my way. I will suffer adversity and disgrace through the fraudulent practices of others. The Jack of Spades is a man who is crude in every way. I can count on unexpected good luck. The Nine of Hearts means that my wish will be fulfilled. I will not receive the money I rightly deserve because unscrupulous individuals will cheat me out of it. The Nine of Spades signifies money losses. I can expect that this attitude on my part will give me a calm but cheerless, existence or a loved one’s disinterest could affect my life in some way. The Ten of Hearts signifies good luck and contentment and tends to alleviate the indifference. I will not receive the favour I ask no matter how much effort I put forth into getting it. The Eight of Spades means opposition. I can be sure that my highest aims will be attained soon. The Two of Hearts signifies a prosperous state or condition. I will suffer a critical illness but I will recover. The King of Diamonds means a business rival.